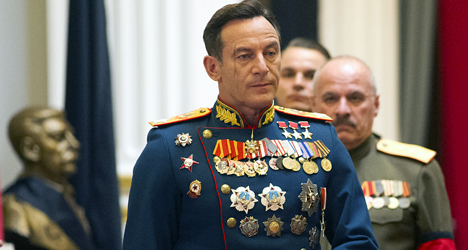 Jason Isaacs stars as Georgy Zhukov in "The Death of Stalin." 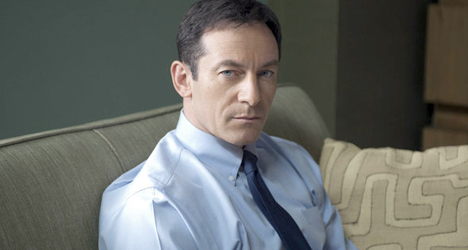 In “The Death of Stalin,” actor Jason Isaacs (“Harry Potter” franchise) stars as Georgy Zhukov, a Soviet Union general who fell out of favor with Soviet dictator Joseph Stalin, but returned to prominence when Stalin died in 1953. Zhukov makes his entrance in the film at Stalin’s funeral and immediately begins to scheme with leaders to stage a coup and regain power. 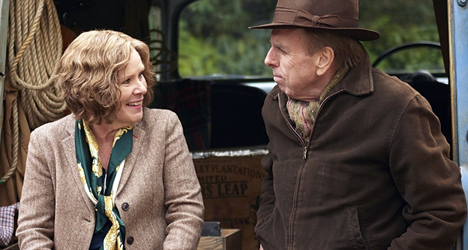 I caught up with Isaacs last week to talk about the film. Was the dry humor evident in the script or did it reveal itself more when you were actually shooting the film? Oh, [the script] was hilarious. A lot of people think the film was improvised, but it was all on the page. The whole thing was very tightly scripted. I could tell it was funny when I read it, but I didn’t realize how true it was. The real insane and surreal episodes were lifted straight from life. Was it necessary to do any research on your character since so much of the story is true? What I needed to know about [Zhukov] is that he felt like he had singlehandedly won World War II. That was apparent from the first photograph I saw of him, which was of this man puffing his chest out and wearing a lot of medals. When people saw the film, they assumed we put more medals on me [for comedy purposes], but the fact is I couldn’t wear as many medals as he wore in real life. I also learned he was the only person who could speak the truth to Stalin because he had the Red Army behind him. Can audiences enjoy this film without knowing much Soviet history? I knew nothing. I assume most of the audiences know nothing. I’ve noticed that audiences in Russia laugh louder and longer, but I’ve seen people falling out of their seats laughing in a lot of different countries at least for the first half of [the film]. Of course, it takes a darker turn towards the end. You’re still laughing, but it’s laughing in discomfort and terror. How did you react when you heard the Cultural Ministry in Russia banned the film and even mentioned your character being “portrayed as an idiot” was one of the reasons it was banned? It wasn’t the Russians that didn’t like it. It was one individual in the Cultural Ministry probably acting out of fear that [President Vladimir] Putin wouldn’t like it if he found out about it. Rather hilariously, their statement of condemnation said [the film] was an attempt to interfere in their upcoming election (on March 18). It’s hard to believe in a modern world anyone would try to ban a film because they would make it the most popular underground film in Russia. It’s a shame because comedy is best experienced and enjoyed with a group of people in a big dark room. I’m optimistic that the ban will be revoked after the election. Could you see Death of Stalin filmmaker Armando Iannucci making a film like this about the Trump Administration? It seems like the perfect style and tone to capture what’s happening right now in the U.S. I don’t think he would, actually. If you think about [writer] Arthur Miller, who wrote “The Crucible” (play and screenplay) about the Salem Witch Trials, that [story is] really about McCarthyism. It’s the same with [Iannucci]. 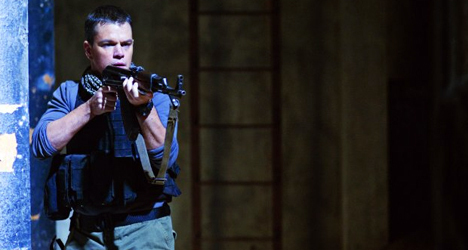 He’s made [a film] about dictatorship and a lack of reasoning that spreads around that kind of terror. You can apply that to any situation anywhere. 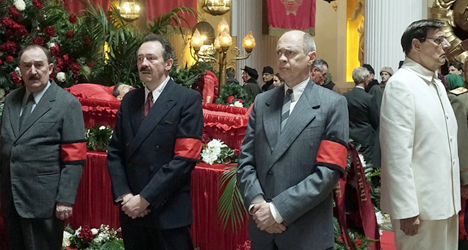 [“The Death of Stalin”] most reminded me of that press conference where all of Trump’s cabinet was wheeled out to pay homage to this medieval king they are working for. See, something like that press conference would be amazing to satirize, don’t you think? Well, the question we get the most now is if [Iannucci] made this [film] about President Trump. The answer is no. It’s timeless. It’s about any time there’s a situation where there’s irrational and terrifying behavior happening. One of the things about the film that I think has worked so well for audiences is that although it’s specifically about the panic and terror in the shadows of Stalin – and the power vacuum that emerged when he died – it’s applicable to so many other situations and so many different countries and politicians of all stripes. We made it in June 2016, so at the time, it felt like it was about Brexit. I know you live in London, but are you aware how much Americans are inundated with Trump news during our 24-hour news cycle? Do you think you’d get tired of it? I’m working in Los Angeles at the moment, so I’m well aware that you can live with Stormy Daniels 24 hours a day on every channel. I think many people understand there was a big smoke-and-mirrors act just over a year ago and that the person in the White House is not who he said he was and is unable to do the things he said he could do. I suspect people are bored because we get distracted from serious matters of policy and security. But all of that is overshadowed by the latest insane, middle-of-the-night dribble that comes out of [the White House]. It seems like British leaders are acting like the adults in the room when it comes to anything Russia-related in comparison to Trump. Well, we just had a couple of people poisoned on British soil and the Prime Minister (Theresa May) made as strong of a response as she could. Every day it seems more surreal and transparent that something really corrupt and dangerous is going on at the heart of American politics. It’s important to be reminded that the people who stand up there pretending to be able leaders are often power-grabbing, narcissistic children behind closed doors. Knowing that, we can then interpret that and act accordingly.